By American Model Builders Inc. 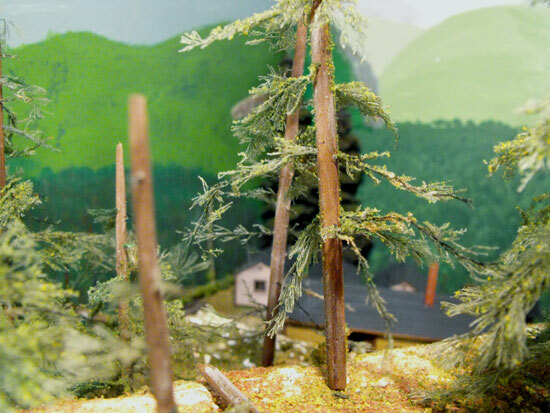 I was building a small logging camp for my HO model railroad, the Utopia Northern. It was inspired by an article by Jeff Johnston in the November, 2009 issue of Model Railroader. I bought the same kits he used. They are made by American Model Builders and are called Laserkit. This is kit No. 710. I began with the three Long - Bell Lumber Company skid shacks. The kits have layered, peel and stick windows and doors and are 100% laser-cut wood. They can be used as temporary housing for loggers, miners or even as a row of small tourist cabins. These make up easily into nice model railroad structures. I deviated from the instructions somewhat. The manufacturer suggests painting or staining the wood before assembling the buildings. This, for me, is a standard practice because stain won't cover glue. The wood in these kits is precisely cut and notched. However, it is very thin and warps. I stained the wood front and back with Hunterline weathering stain instead of painting them. I immediately put all the pieces under weights to help them dry flat. There was still a little warping. It is also my practice to install the doors, windows and window glazing while the walls are still flat on the workbench. This is where I deviated from the sequence in the instructions. The instructions are clear and concise and there's a simple drawing with letters and numbers to follow. The next step was to assemble the walls. I used Weldbond white glue that dries clear. It sets up quickly. I assembled the HO logging camp shacks on a MicroMark metal tray with their magnets to hold the building together. I didn't have to use clamps. The floor and the notches help to keep the kit square. I also added bracing in all four corners and along the floor edges. This helps to control warping. I then installed the basic roof pieces before the glue dried. I used metal squares to weight the roof pieces while they dried. After the glue had dried I removed the buildings from the tray and added the corner trim and the skids. Finally I added the peel and stick rolled roofing. I cut the pieces slightly long and trim the edges before painting with a sharp razor blade. I painted the rolled roofing with Polly Scale tarnished black, and drilled a hole for the smoke stack. I mixed a little black paint with the white glue and used this to secure the smokejack. It looks like tar. I painted the smokejack black and added a few rust streaks. This was an enjoyable project. I didn't try to finish the three shacks in one evening although the manufacturer suggests it can be done as an evening project. The kit is recommended for ages 14+. I built one skid shack completely before tackling the other two to make sure I understood how they went together. The precise laser-cutting sure makes it simpler to assemble the ho logging camp skid shacks. After building the skid shacks I made the freight terminal kit to act as a site office and then added the portable tool and handcar shack as a separate tool storage building. All these kits were by American Model Builders as featured in Jeff's article. The space I had to work with was a weird shape tucked into a corner behind a rock face of styrofoam about 5 inches high. This made the area very difficult to reach so I decided to cut a piece of masonite to slip into the area. This allowed me to finish the scene on the workbench. First I had to paint a backdrop. I painted a mountain scene to connect with the experimental backdrop I had painted earlier. i did not cove the corner as it would have been too difficult. Instead, I planted a couple of pine trees on the back corner of the masonite to act as a partial view block. It is not easy to see into this scene so the entire logging camp comes as a bit of a surprise to people viewing the layout for the first time. The camp was served by a length of dual guage HO/HON3 track that curves into the scene behind the rock face and hill. I saved the buildings for my new UNRR. The ho logging camp now lives on at Mt. Martin. 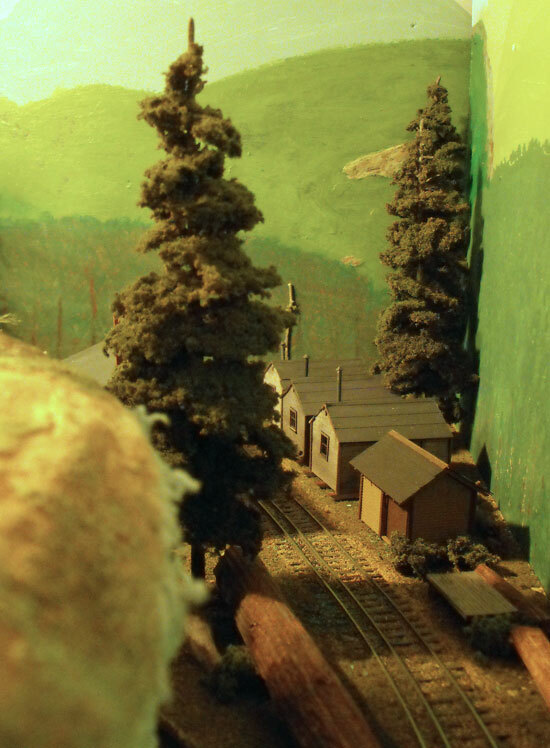 I finished the scene with some ground cover and ballasted the track that extends beyond the scene to the turnout for the siding. 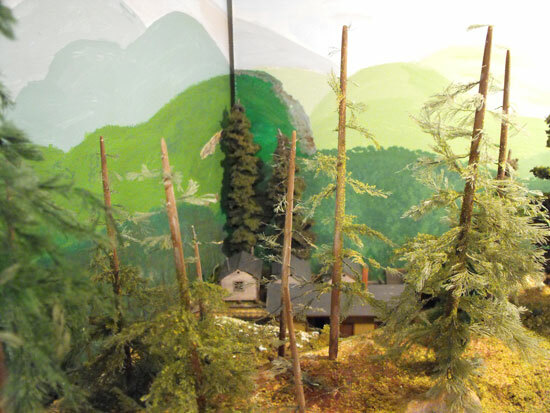 Now I have to make some aspen trees to justify the ho logging camp area as "Payne in the Aspens" because the area is named after fellow member, Bill Payne, of our Nottawasaga Model Railway club (NMR). Below are a few photos of the completed scene. I had been staring at this space of real estate for a few years wondering what I could do about it. Now it's done and I have the courage to tackle the rest of the wall that still needed a background. That's another modelling story. Return from "ho-logging camp" to my Product Reviews page. Go from "ho-logging camp" to my backdrop painting experiment. Return from "ho-logging-camp" to my Home Page.